Infographic: What is On-page SEO and Why is it So Important? On-page SEO refers to the optimization of specific web page’s content using key factors and SEO best practices. It is carried out for making it easy for search engines to crawl, understand and index the content of a website in order to get it featured in the initial pages of the SERP (search engine results pages). Over the past few years, Google has rolled out a number of significant updates in the search results ranking algorithm in order to provide users the best content and the best experience possible. Crazy algorithms changes like Google Panda, Penguin, and Hummingbird has had a profound impact on the SEO industry. These three major updates left many Webmasters and SEO professionals wondering if the On-page optimization still works, or if it’s finally dead. But in fact, SEO is still alive and well and surely will never obsolete in future. The reason is users will always use search engines to discover something, and search engines will require using some algo to deliver them relevant results. Have a look at some stats given below, which proves the majority of web traffic is generated by search engines. All these statistics shows, why On-page SEO will play a vital role in promoting your online business in future. To help you further understand the importance of On-page optimization, we’ve created an insightful infographic that shows you 10 major reasons on how On-page SEO is still essential to get ranked higher in search engines. On-page optimization lays the foundation for all of your SEO efforts that you put to get ranked higher in search engines. If it's not done the best way, your other SEO related activities will not be effective as expected. As On-page SEO involves content creation and using code, chances are high that your website will be featured in the initial pages of the search engine results. Optimizing headings tags doesn't only improve reader's experience, but also tells search engines what your content is about. On-page SEO lets you make great use of keywords. When you insert your targeted keywords in title, description and URL as well as in the first phrase of your content, it helps search engine bots find your content easily, which improves the search engine ranking of your website. When you link your content to your site’s relevant pages and other authority sites, your website is optimized for several related keywords. This doesn't only help search engine determine the nature of the web page you're linking to, but also increases the“share-worthiness” of your content. On-page SEO requires you to fix broken links (both internal and external) on your site. However, it's not a huge ranking factor, but a fairly important one. Fixing all broken links makes your site look more professional and improves overall user experience. Certain keywords are searched for more than others, and including the more popular one in your content makes a big difference in search results. Therefore, an on-page optimized website draws a larger volume of traffic when relevant keywords are searched. As On-page optimization lets you take advantage of targeted keywords, more and more users visit your site, which results into generating a huge amount of revenue from your site. On-page SEO is significantly beneficial for websites which are based on pay per click revenue generation system. On-page SEO enables you keep your website's internal structure clean and spider-friendly that Google loves. It helps you refrain from meaningless URL structure that doesn't make any sense to both readers and search engine bots. When your website's architecture is well optimized, it increases usability and user experience. Google has already confirmed that site load speed is an important factor in determining your ranking in search engines. On-page SEO techniques allow you to boost your site speed by optimizing images, using a CDN, and avoiding un-necessary use of flash and pictures. This improves user experience and reduces bounce rate. 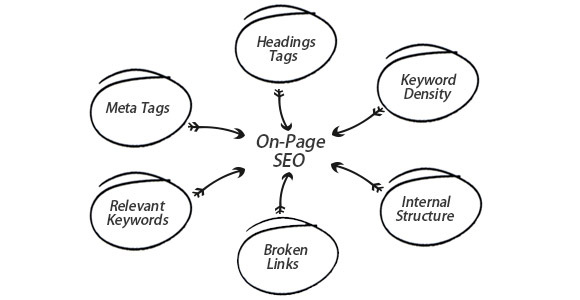 On-page SEO helps you keep the keyword density on a web page optimum. To keep your text writing natural, we suggest you to stay within 4% keyword density. This way, you'll not be a victim of keyword stuffing, which is one of the biggest reasons of getting penalized by Google. A great tool by Google that you can use for keyword research. It helps you get thousands of keyword ideas and their traffic estimates, and lets you develop the right list of keywords accordingly. A free tool to analyze your website speed and performance. Using Yahoo! YSlow and Google Page Speed tools, Gtmatrix generates scores for your pages and provides actionable recommendations to fix issues. A small desktop program that you can install locally on your computer. With SEO Spider, you can quickly analyze, audit and review your site from an on-page SEO point of view. It is Moz's search engine for links that lets you analyze anchor text, view social activity data, and identify top pages of your site. Also, you can perform competitive link research for intelligent, targeted link building. A Chrome extension that crawls through a web page, finds all the links on that page, checks each one of them, and highlights all broken as well as valid links. A Firefox extension that enables you obtain and investigate a number of prominent SEO parameters such as keyword density, internal and external links, Google PageRank, Google Index , and many more.